12 minutes on the 6 key principles will help you persuade and get to “YES” effectively! Specific verbal behaviours are crucial in moving, persuading and influencing other people. Ongoing behavioral research and studies at Huthwaite International still show us that executing these verbal behaviours effectively will make you stand out, whether it might be the key behaviours needed in meetings, sales, negotiations, service or coaching situations. Some say persuasion is an art, other say its science, or maybe even both. Other experts in the field of psychology offer insights by scientific contributions that both build on and support this. Some of you might have heard of Dr. Robert Cialdini’s research studies that brought us Influence, the classic book on persuasion. In this short youtube video Robert explains in RSA-style the psychology of why people say “yes”—and how to apply these understandings. Dr. Robert Cialdini is the seminal expert in the rapidly expanding field of influence and persuasion. You will get to know what 6 universal principles will help persuade and get to YES effectively. How to do it then? The natural question then. 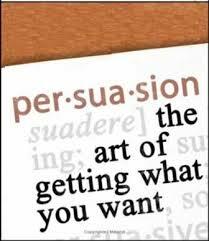 How to apply these persuasion principles and convert them into specific verbal behaviours that works in real life situations? The founder of Huthwaite International Dr. Neil Rackham and his research team uncovered the specific verbal behaviours that the best persuaders in the world (Sales People) use every day to get to “YES” with their clients around the world. You can read about these in the international best seller: SPIN® Selling, or feel free to give me a call to be inspired, or keep on following this blog, as I share insights and research findings, on the go. Thirty-five years of rigorous, evidence-based research along with a three-year program of study on what moves people to change behavior has resulted in this highly acclaimed book. Recommended reading by the way. I was suggested this website by my cousin. I am not sure whether this post is written by him as nobody else know sufh detailed about mmy problem. Your welcome – let me know If I can be of any help Robbert. All the best. Right here is the right blog for anyone who wants to find out about this topic. a brand new spin on a topic that has been discussed for decades.